Undergraduates learned about the policy’s new details in an email on March 3 from Interim Dean of the College Inge-Lise Ameer. "This policy is one piece of President Hanlon's plan to create a safer community that supports the academic mission of the College and your success," wrote Ameer. "Your Dartmouth experience doesn’t have to include hard alcohol." Beginning with the launch of the Dartmouth College Health Improvement Project (DCHIP) in 2011, the College made it a goal to eliminate dangerously high blood alcohol concentrations (BACs) among students, leading to measurable improvement. The number of students treated for dangerously high BACs dropped from 80 in 2011 to 63 in 2012, and was 31 in both 2013 and 2014. 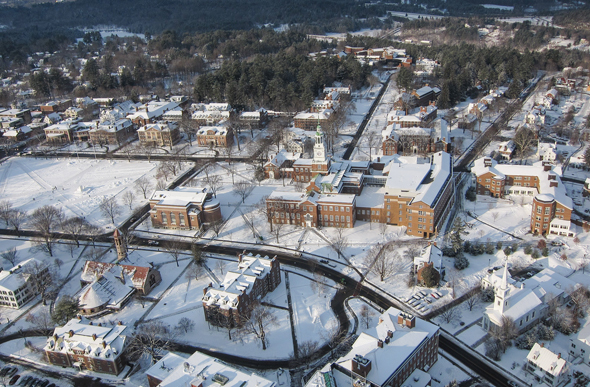 The hard alcohol policy was announced in the Jan. 29 Moving Dartmouth Forward speech by President Phil Hanlon ’77 and is intended to promote student safety and well-being. In his speech, President Hanlon said the vast majority of alcohol-related emergencies that send students to the hospital are the result of drinking hard alcohol rather than beer or wine. "When it comes to a safe environment—and one that is advantageous to learning—we know that excessive drinking is one of the most pressing challenges that all colleges and universities face," Hanlon said in his speech. "Dartmouth will take a lead among colleges in banning hard alcohol on campus." In its report to Hanlon, the Moving Dartmouth Forward Presidential Steering Committee, which the president appointed last spring to make recommendations in the Moving Dartmouth Forward process, wrote that anecdotal evidence indicated that "hard alcohol is involved in almost all alcohol-related (medical) transports." The new rule does not change the Good Samaritan policy, according to which students who seek assistance or help another student will not be subject to disciplinary action under the alcohol policy. At a forum for students on Monday night, March 2, Ameer emphasized that students should continue to look out for each other and call for help without fear of alcohol-related sanctions. The ban is on alcoholic beverages that are 30 proof or higher. Proof is a measure of how much alcohol a beverage contains. Liquor that is 30 proof contains 15 percent alcohol. Typically, beer and other malt beverages, wine, champagne, and hard cider are under 30 proof. While the new hard alcohol restriction applies only to undergraduate students and the facilities specified in the policy, Hanlon has called on the Dartmouth community to follow suit by not serving hard alcohol at college-sponsored events on campus. The new policy includes disciplinary sanctions that are more severe than sanctions for alcohol violations involving beer and wine. Students will be placed on probation for a first violation and suspended for a second violation if they are in possession of or have consumed hard alcohol, or in cases of public intoxication. Organizations providing hard alcohol will face a one-term suspension for a first violation, a one-year suspension for a second violation, and permanent loss of College recognition of their organization for a third violation. An organization's leaders and event coordinators will also be held accountable for these violations. If other violations of College standards—such as causing physical harm, damaging property, or sexual misconduct—are found to be part of an incident involving hard alcohol, students can expect the disciplinary sanctions to be more severe.